Monogrammed Towels from our favorite designer, Matouk. 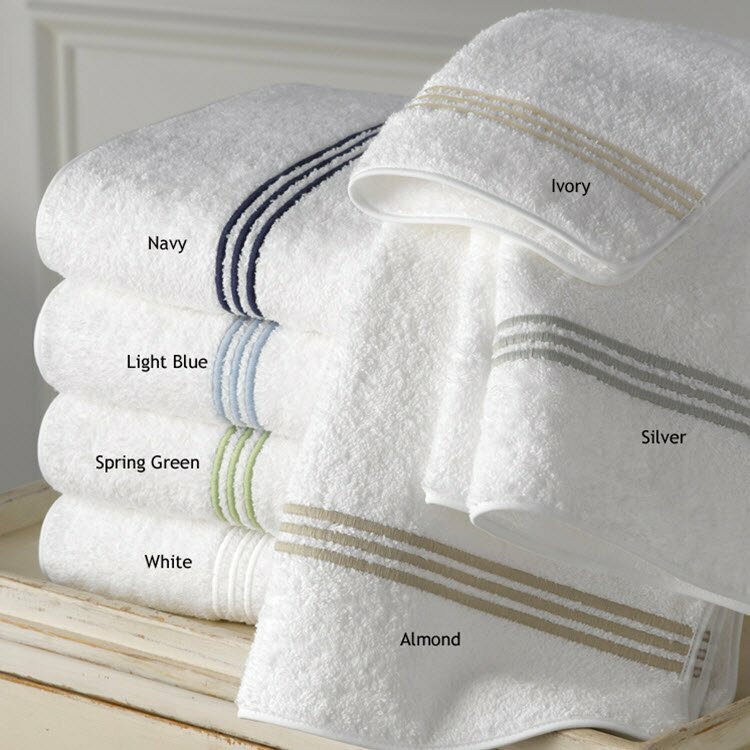 These are Made in the USA of Cairo Egyptian cotton terry with three embroidered lines and finished with white piping. 1. Select your trim color. 2. Select the pieces you would like. Only selected pieces will be added to your cart. 3. Select your monogram style. 4. Select the thread color for your monogram. 5. Complete the monogram instructions. 6. We will put it together for you! We also have the matching shower curtains and bedding. All monograms are custom made and sewn from the highest quality fabrics. Please allow six to eight weeks for delivery. Price: $0.00 In stock! - Browse this brand: Monogrammed LinenOur products are custom made to your specifications. This product ships up to 8 weeks after your order is placed. 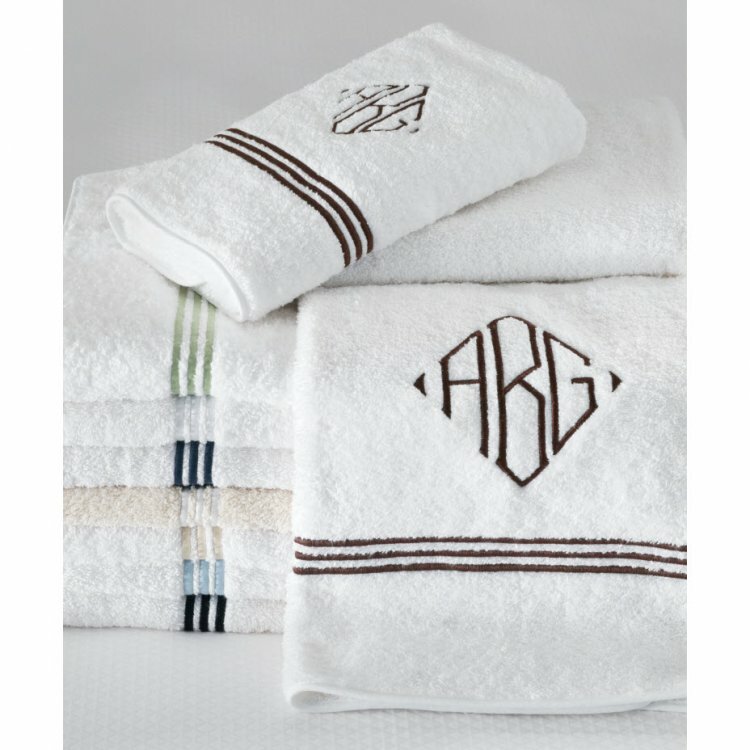 Bath towels are 30 x 52 and come with a 5.5" monogram placed 4" from bottom edge or with no monogram. Please select the bath towels you would like. Hand towels are 18 x 32 and come with a 3.5" monogram placed 3" from bottom edge or with no monogram. Please select the hand towels you would like. Wash cloths are 13 x 13 and come with a 2.5" monogram placed 2" from bottom edge or with no monogram. Please select the wash cloths you would like. Guest towels are 14 x 21 and come with a 2.5" monogram placed 2" from bottom edge or with no monogram. Please select the guest towels you would like. Bath sheets are 36 x 75 and come with a 6.5" monogram placed 5" from bottom edge or with no monogram. Please select the bath sheets you would like. Tub mats are 24 x 36 and come with a 5.5" monogram placed 5" from bottom edge or with no monogram. Please select the tub mat you would like.